Patina Gallery has just added photos to their Flickr Gallery including some polymer clay pieces by Ford and Forlano. Be sure to note their reversible necklaces that offer a different colorway and pattern on each side. Two for the price of one! Note: Read Judy Dunn’s recent interview with David and Steve here. France’s Celine (aka gRIS bLEu) marries graphics and organics in an eye-catching way with this new polymer clay necklace. I’m still playing and away from the computer. Luckily Kim Cavender and Lindly Haunani have kept their noses to their monitors to bring you polymer news. Talk amongst yourselves. This polymer clay hostess gift from Maryland’s Mari Odell to Taz Chaudry has a lovely story. Mari pressed transluscent faux jade into antique Japanese sweet mold fragments to create the centerpiece of the necklace. 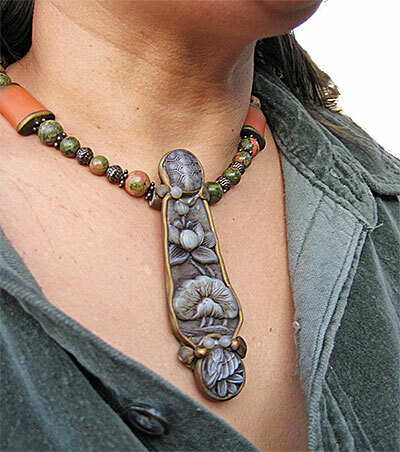 The side beads are a combination of extruded polymer, serpentine jade and antique brass. Mari taught high school art in Maryland and Taz was her student. Twenty-five years later Taz contacted Mari to thank her for that high school inspiration and Taz, now in Colorado, hosted Mari on her visit. And once again Mari had an opportunity to teach Taz art, this time polymer clay. The ecologic, economic, social, and political price of gold is far costlier than we imagine. We are in the midst of a new gold rush, one that is consuming wilderness areas, contaminating watersheds, destroying ecosystems, and imperiling the economics of poor nations and the well being of indigenous people throughout the world. Some cumulative, irreparable consequences of mining will be with us, in this country and around the world, forever. Huge, multinational corporations very eager to cash in. The Bead Dreams competition polymer clay entries are online for your Monday inspiration. This entry from California’s Kaaren Poole is perfect for harvest time with the bunny tucked in among the verdant veggies. While there’s no polymer mentioned in Kaaren’s website, it’s obvious that she’s transferred her love of tole and decorative painting into polymer work quite effectively. Congrats to all the Bead Dreams participants. And remember there are only a few days left (September 1) to enter your work in the NPCG Progress and Possibilities exhibition. Apply online here. NPCG president Judy Belcher and her crew of officers have done a gold-medal job of taking the national (now international) guild to new heights. But this is a relay event and the baton must be handed to a new team of NPCG officers. The new group will have the support of an executive director plus past and current officers to help realize their vision, their ideas. The same skills you use to create and problem solve in the studio can be used to impact a worldwide community of artists. Read Judy’s tell-all and the list of positions to figure out where you’d fit best. Then submit your nomination. There are only two weeks left and NPCG needs you. The six open NPCG positions include: President, VP Education & Outreach, Treasurer, Recording Secretary, Guild Liaison, International Guild Liaison. Write Julie Picarello for more information. As long as you’re getting paperwork out of the way, don’t miss the chance to share free NPCG space at the ACRE show. The deadline for application is September 10. Just back from touching base with the Euro contingent, Judy Belcher was stunned by the energy and vitality of the polymer clay art there as sampled in the work from Spain’s Ana Belchi. Julie Picarello sent along a link to fellow Clayville California Guild officer, Maureen Thomas. A long-time button collector, Maureen was creating a polymer clay tile bracelet based on a Gwen Gibson design and found that her elastic was too thick to knot and pull back into the drill hole. She grabbed a button to use as a clasp and made it a focal point of the bracelet. Check out her can-do approach to polymer on her Flickr site and blog. Pennsylvania’s Lauren Cole Abrams(LaBeana) has returned to polymer clay, making graphically inspired, larger necklaces and brooches. She also makes a line of resin purse handles and buckles using molds of her polymer clay designs. She explains, "I start by honing my designs on paper, drawing ideas from a lifetime of work in graphic arts and painting. Then I bring them to life using polymer clay, a process I enjoy in itself. From there I make RTV molds of the originals and cast them in resins…tinting them with different colorants, dyes and metal powders. When the pieces are cured, I remove them, sand and polish them and do any hand painting, staining, buffing and finishing they require." Vacation note: I love looking at what other artists are reading. Here are a couple that I found on friends’ desks.